Microsoft recently held a seminar at the Kingsbury Hotel on future-proofing the workplace. The audience comprised of over 100 partners and customers who explored new and innovative cloud services to drive trust, innovation, partnerships, collaboration, and security in the workplace. “At Microsoft, our mission is to empower every person and every organisation on the planet to achieve more. We help companies protect their business-critical data. We help them understand the best security measures for their data, ensuring total responsibility of GDPR compliance,” said Microsoft Sri Lanka and Maldives Country Manager Hasitha Abeywardena while delivering his keynote on the importance of data accountability in the modern workplace. Microsoft Teams is a hub for teamwork, a chat-based workspace that enables teams to be more productive by giving them a single and secure location, bringing together everything a team needs: chats, meetings, calls, files, and tools. The platform features extensions that can integrate with non-Microsoft products. “The way we work is changing. It’s faster-paced combined with higher pressure. There’s a sense that everything is needed immediately. The ability for more people to collaborate on projects at the same time, the faster the results,” added Niyaz. Microsoft Southeast Asia New Markets Software Asset Management and Compliance Lead Chinthaka Dunuwille said: “Without the appropriate IT policies at work, employees may unknowingly download unlicensed software bundled with malicious software – or malware – jeopardising company-wide security.” He also discussed the realities of cybercrime and how Microsoft can help companies stay secure from cybercriminals. Microsoft APAC Cloud Economics Lead Meng Keat Ng illustrated how technology can help companies address their business challenges and cost control. He also encouraged the audience to optimise their software licensing investments to enable greater productivity without compromising on security. Microsoft Sri Lanka and Maldives Account Technology Strategist Ruvini Bandara enlightened the audience with her interactive demo of Microsoft Cloud App Security. The Cloud Access Security Broker (CASB) solution gives users visibility into their cloud apps and services, provides sophisticated analytics to identify and combat cyber threats. Microsoft Southeast Asia New Markets Legal and Corporate Affairs Head Shalini Ratwatte took the stage to address and demystify concerns over cloud computing policies, GDPR, and other compliance issues. She also led the question and answer session with Meng Keat Ng and clarified questions from the audience on regulatory compliance around IT and cloud computing. 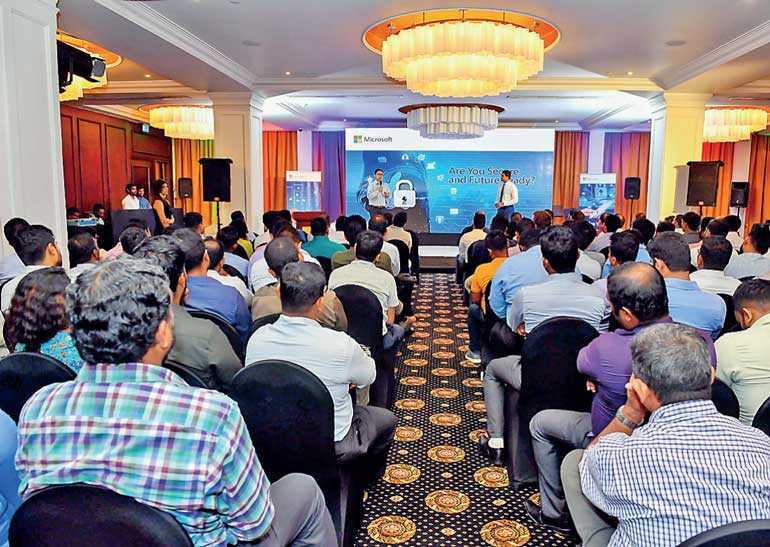 With the endless possibilities that digital transformation can bring to Sri Lanka, Microsoft is committed to helping enterprises accelerate their digital transformation journeys. The company is encouraging enterprises in Sri Lanka to accelerate their customer reach with 50% Off on Office 365 Business Essentials and 20% Off on Office 365 Business Premium.